Safety is an industry within the utility industry, and the Lineworker at the utilities are required to demonstrate this every day in the execution of their duties. 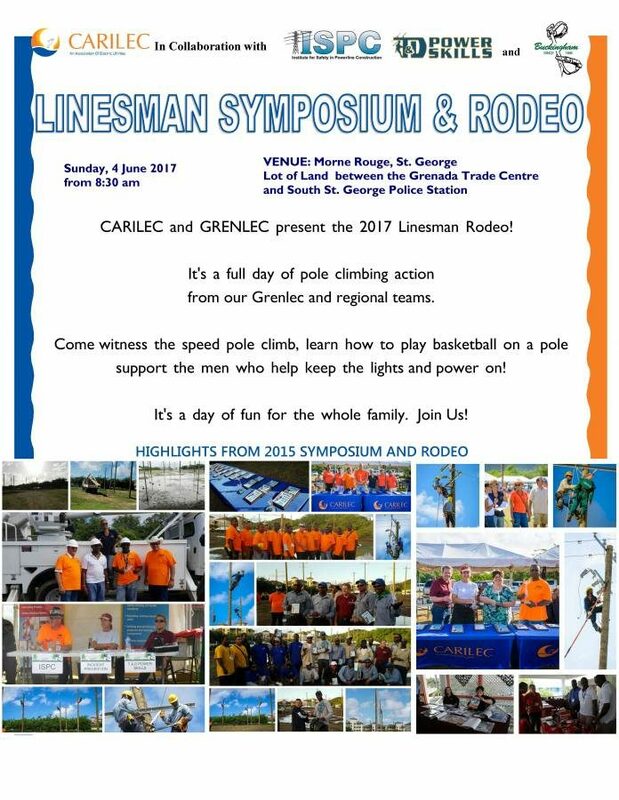 CARILEC, in collaboration with GRENLEC, has planned its 2017 Linesman Symposium and Rodeo in Grenada under the theme: “Linesman Safety: Meeting the Challenge.” The week of activities starts Monday, 29 May 2017 and culminates with a rodeo on Sunday, 4 June 2017. The Caribbean Electric Utility Service Corporation (CARILEC) is an association of electric utilities, suppliers, manufacturers and other stakeholders operating in the electricity industry in the Caribbean. CARILEC was established in 1989 with 9 members as part of an electric utilities modernisation project funded by USAID and implemented by NRECA under a 5-year “Cooperative Agreement.” Currently, CARILEC comprises a total of 106 members, including 35 Full Members that are electric utilities, 65 Associate Members that are companies involved in some aspect of servicing the electric utility business and 6 Affiliate Members.CARILEC’s Associate Members, the Institute of Safety in Power Line Construction (ISPC) and T&D Power Skills are the main sponsors of the event, while Buckingham is the supporting sponsor for the rodeo. CARILEC’s Associate Members, the Institute of Safety in Power Line Construction (ISPC) and T&D Power Skills are the main sponsors of the event, while Buckingham is the supporting sponsor for the rodeo. The symposium will include training events for Lineman Supervisors and Lineworkers, seminar presentations and a technical tour of the GRENLEC plant. Sunday, 4 June takes the crew to Morne Rouge, St George (the lot of land between the Grenada Trade Centre and South St George Police Station) for the competitive rodeo event. The rodeo comprises various competitive pole-climbing events that challenge the linemen to safely demonstrate skill under pressure with agility and accuracy. It requires the Lineworkers to bring all of their experiences to bear in a series of tasks that demand safe execution and no room for error. Points will be lost on every infraction; therefore the teams are compelled to view their work with a keener eye for safety in an environment of fun. The event is free and the public is invited to turn out in large numbers to support the linemen. To learn more about the CARILEC Linesman Symposium and Rodeo explore our website www.carilec.org, follow us on twitter https://twitter.com/carilecpower or like our Facebook page at https://www.facebook.com/carilecpower.